In December, 1855, the Black River & Utica Railroad opened its tracks from Utica to Boonville, NY. Following a foreclosure sale in 1858, it was reorganized as the Utica & Black River Railroad (U&BR) The line was extended to Carthage, with connections to Lake Ontario and the St. Lawrence River. In 1886, it was leased in perpetuity to the Rome, Watertown, and Ogdensburg Railroad (RW&O). The lease was transferred to the New York Central Railroad in 1891. The Mohawk & Malone Railroad (M&M), built by Dr. William Seward Webb, which formed a junction with the RW&O at Remsen, was completed in 1892. The M&M was built through the Adirondacks in eighteen months. Using a Herkimer - Remsen line, it offered service from NYC to Montreal via Albany, Utica, Remsen, Saranac Lake, and Malone. Later the Herkimer line was replace by a Utica - Remsen route using RW & O track. This new railroad opened the interior of the Adirondacks to the public. Two years later, Webb leased the M&M to the NYC. 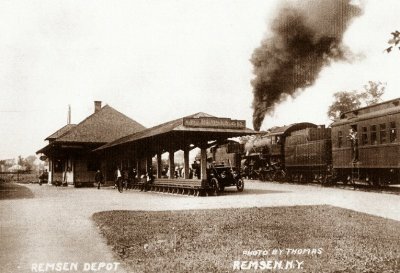 Remsen became a very busy rail hub, as the only station between Utica and Watertown where all three NYC divisions converged and a turntable was operated. The original station at Remsen burned in the late 1890s. Its replacement served as many as 40 passenger trains a day. Notable passengers, many with private cars, included the Webbs, Rockefellers, Whitneys, Roosevelts, and Vanderbilts, en route to their Adirondack "great camps". Many other tourists came to Remsen to board trains, sustaining a flourishing local hotel and restaurant trade. At one time, the Remsen yard contained 9 tracks. At least 17 turnouts were used by many local businesses and industries associated with the railroad including a stockyard, coal yard, milk plant, feed mill, lumber yard, and cold storage plant. Many photos recorded the events of July 21, 1907, when a large boulder from the Pirnie farm south of the village was loaded onto a flatcar for transport to Herkimer to be used as the base for the General Herkimer Monument. As in many communities, the advent of cars and highways heralded the rapid decline in railroading. By 1926, passenger trains had dwindled to about 10 a day. Passenger service from Herkimer ended in 1934. The last passenger train on Webb's Adirondack Division line was in 1964. Freight traffic was reduced to a few trains a month. The second Remsen Depot was torn down in the mid-1960s and the turntable was removed shortly thereafter. Subsequently, decades of growth and debris overtook the water tank, turntable, and depot sites. A brief rail revival took place when trains to the 1980 winter Olympics rambled through town to "Snow Junction" north of the village where they switched to the Lake Placid tracks. Spirits sagged when the operators, who had plans to revive the line, went bankrupt. When the Adirondack Scenic Railroad (ADIX) began operating short runs out of Thendara in 1992, local rail enthusiasm soared. ADIX's overwhelming success led to round trip passenger service from Utica to Thendara commencing in August 1998. Remsen became the major flag stop station on the route. Freight traffic has also increased on the Mohawk, Adirondack, & Northern Railroad (MA&N) using the Utica-Lyons Falls track of the RW&O.